In honor of our collab with the fabulous Gia Graham, Paper Epiphanies will be highlighting the 6 amazing women depicted in these cards during the entire month of February in a new series we call Wonder Women #GGxPE. In this series we aim to show you a side to these notable women that you might not have seen before by presenting, first, the brief biography found on the back of every #GGxPE card and, second, 10 fun facts about their careers, activism and lives. We hope you appreciate them as much as we do! Lucille Clifton (1936-2010) was an author, educator and Poet Laureate of Maryland. Clifton’s poem “Homage To My Hips” celebrated the African-American female body as a source of power, sexuality, pride, and freedom. 1. Girls in Clinton’s family were born with an extra finger on each hand— a genetic trait known as polydactyly. Clinton’s two extra fingers were amputated when she was young but her two “ghost fingers” remained a theme in her writing. 2. Clinton’s mother was also a poet, though worked as a launderer. 3. Clinton’s parents passed an appreciation of books and reading to their children, even though neither was formally educated. 4. Clinton first entered Howard University early, at only 16 years old, as a drama major. She then transferred to Fredonia State Teachers College three years later, where she began to develop her acting a poetry. 5. Clinton’s first poetry book Good Times (1969) won The New York Times’ Ten Best Books of the Year. 6. Clifton was the author of more than sixteen children’s book intended specifically for African-American children. 7. Clifton was the first author to have two books of poetry nominated for the Pulitzer Prize. 8. Clinton touches on many intense subjects in her poems including oppression, death, molestation and racism, as well as pride in her ancestry and the black female body. 9. Clinton was influenced spiritually by many religions and religious figures, including Jesus, the black God Kali and many other African goddesses and Native American beliefs. 10. Clinton was a mother of 6 and often was inspired by her family and children in her work. Maya Angelou (1928-2014) was an author, actress, dancer, poet, civil rights activist— and Oprah’s friend. Angelou made literary history when her memoir “I know why the caged bird sings” became the first nonfiction best-seller by an African-American woman. 1. Angelou was originally born Marguerite, which became Maya when her older brother started calling her ‘My’ or ‘Mya sister’. 2. At the age of 16, Angelou became the first black, female cable car conductor in San Fransisco. This lead to a lifetime award she received much later in 2014 from the Conference of Minority Transportation Officials at a session titled “Women Who Move the Nation”. 3. Angelou toured around Europe with a troop performing the opera Porgy and Bess and in each of the countries she visited, she made an effort to learn its language, soon becoming proficient in several languages. 4. Angelou met and became good friends with Malcolm X during the years she spent in Ghana, where she was active in the African-American expatriate community. 5. Martin Luther King Jr. was assassinated on Angelou’s 40th birthday, and while she was devastated, it was also in this year that Angelou’s creative genius really began to emerge. 6. Angelou’s Georgia, Georgia (1972) was the first screenplay written by a black woman. 7. Angelou participated in a lecture circuit starting in the 1990s and continuing almost until her death in 2014 in her own customized tour bus. 8. Angelou read her poem “On the Pulse of Morning” at the presidential inauguration of Bill Clinton, making her the first person, since Robert Frost in 1961 to read a poem recitation at a presidential inauguration. 9. Angelou self-proclaimed her image as “the people’s poet”. 10. When Angelou died, she was in the process of writing another autobiography: what would have been her eighth. Zora Neale Hurston (1891-1960), best known for her acclaimed novel “Their Eyes Were Watching God”, was an author, an anthropologist and a fixture in the thriving art scene during the Harlem Renaissance. 1. Hurston was raised in Eatonville, Florida, one of the first all-black towns in the US. 2. In a career that spanned 30+ years, Hurston authored and published seven books—including an autobiography, several short stories, plays and essays. 3. In 1917, Hurston pretended she was ten years younger than she actually was so she could enter public high school, and never added those years back— always saying she was ten years younger than her actual age for the rest of her life. 4. Hurston went to Howard college for her undergraduate education, making a mark on the university by, for example, co-founding the university’s newspaper. 5. She won a scholarship to finish her undergraduate education at Barnard College of Columbia University, making her the sole black student to attend at that time. 6. Hurston was married three times, two of them lasting less than a year. 7. Hurston made several trips around the Caribbean and the American South, conducting Anthropological studies, which she would then use later to inspire and inform her writing. 8. Hurston never made much money from her work and, following her death, remained in an unmarked grave from lack of funds for a headstone until 1973 when Alice Walker found her grave and gave her a simple headstone herself. 9. In 1927, Hurston was captivated by a the story of Kossola, the last surviver of the last trans-Atlantic slave trip. At the time, she couldn’t find someone to publish her nonfiction account of his story, but this past year, the book has finally been released: Barracoon: The Story of the Last “Black Cargo”. 10. To all that met her, Hurston was a vibrant, bright personality, who would captivate most anyone she met. Our next Wonder Woman is Harriet Tubman (1820-1913), an activist and a true freedom fighter. ‘Conductor’ for the Underground Railroad, Civil War spy and the first woman to lead an armed expedition in the war. Harriet was a badass. 1. Tubman was born Araminta “Minty” Ross, changing her name after her marriage to John Tubman. 2. Tubman was one of nine children and spent her entire life fighting to keep her family together. 3. Tubman was sometimes referred to as Moses by those she guided in the Underground Railroad and, as a result, the song ‘Go Down Moses’ became a symbol of freedom and the fight against slavery throughout the Civil War. 4. Suffering multiple serious head wounds during her youth, Tubman was struck by visions, seizures and fainting episodes for the rest of her life, which she described as visions from God. 5. Tubman rescued around 70 slaves in thirteen separate expeditions. 6. Tubman’s second husband was 22 years younger than her and they married in 1869, adopting their child, Gertie, in 1874. 7. Despite Tubman’s outstanding service toward her country and others, she remained in poverty for most of her life, due to irregular and unfair pension following the Civil War. 8. Tubman treated Civil War soldiers as a nurse using her knowledge of herbal medicines. 9. Towards the end of her life, Tubman spent her remaining days in the home for the elderly that she had herself created several years earlier. 10. The US government is in the process of considering moving Andrew Jackson’s face from the front of the twenty dollar bill to the rear in 2020 and instead replacing it with Tubman’s face to honor her efforts posthumously. This process is being fought against by some, who claim that this is not an important enough issue to be debated at the moment. First up is the inspiring Sojourner Truth (1797-1883). Born into slavery, Truth escaped to freedom with her infant daughter in 1826 then became an abolitionist and women’s rights activist. Considered a radical, she sought political equality for all women. We have already done a Woman of the Week post on this blog about this amazing lady, so for a more detailed account of her life, check the post out. 1. Truth was originally born Isabella Baumfree but changed her name in 1843 when she also became a devout Methodist. 2. Truth was one of the first black women to win against a white man in a court of law. 3. The original documentation of Truth’s most famous speech, “Ain’t I a Woman”, contained no mention of these words, but instead a recording by Frances Gage twelve years after her speech was the first to quote the actual words, “Ain’t I a woman?”, which it did four times. In fact, the whole recording by Gage contained speech patterns characteristic of Southern slaves, when Truth was actually enslaved in New York and likely did not speak as such. There were many more inconsistencies in Gage’s report as well. Regardless, Gage’s version of Truth’s speech is the most famous version. 4. Truth was a mother of 5 children. 5. Truth met Abraham Lincoln in 1864, just a year before his assassination. 6. Truth’s first language was Dutch. 7. Truth’s son, Peter, for whose freedom she had fought for and won in court, disappeared several years later after taking a job on a whaling ship. 8. Truth helped recruit soldiers for the Union Army during the Civil War. 9. Truth could not write but managed to publish her memoir, The Narrative of Sojourner Truth: A Northern Slave, all the same by dictating to her friend Olive Gilbert. 10. Truth was not only an advocate for women and fought against slavery, but she was one of the first to do this in one fell swoop: equality and freedom for all slaves, including women. This February, Paper Epiphanies is releasing six cards very close to our hearts in a collab with the lovely Gia Graham. Together we chose to highlight 6 powerful African American women in history who fought for both their rights and the rights of others in our new GIA GRAHAM x Paper Epiphanies line (GGxPE). With a combination of Gia’s stunning designs on our letterpress cards, we have produced a product that we feel truly encapsulates the history and impact of these wonder women. We thought the best way to introduce this new collab was to share our appreciation of the fabulous Gia with you in another installment of Either/ Or. Born and raised in Barbados, Gia moved to the United States to attend school in Georgia. After getting her bachelors in 1999 in Graphic Design, Gia moved first to Chicago, then back to Atlanta, working with various companies as a designer. In 2005, Gia left the corporate world to co-found a custom invitation design company, where she had the opportunity to infuse her creativity to its full extent into her work. 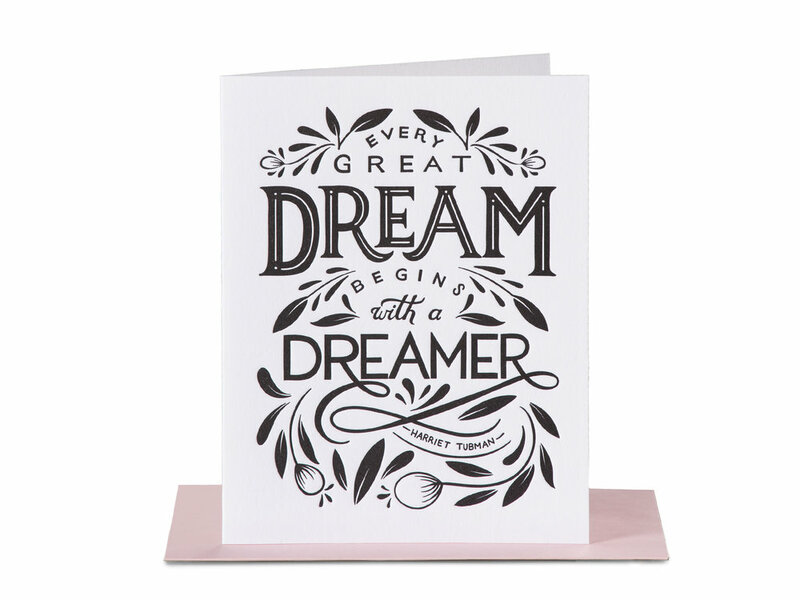 After leaving this company and starting a new brand focusing specifically on custom wedding invitations, Gia shifted her focus towards the larger stationery world, launching greeting cards and gift products that were sold at over 250 stores around the world. Today, following the birth of her second son, Gia has left wholesale and moved on to freelance design in stationery, textile, gift and homeware products. Which is where we found her! Gia aims to combine the “opposing cultural aesthetics” of the island world where she grew up and the urban world in which she lives now, resulting “in modern design enlivened with lush florals, foliage and a keen eye for color”. In our collab, Gia’s unique background and experience come together to make a truly special line of cards where you can see her style shine. Check out GGxPE and check out Gia! Kids... although some days I would legit trade my kids for a Labradoodle. Ice cream or French fries? FRIES. Carbohydrates are my love language. ACK! Don't make me choose! In May, Paper Epiphanies released a collaboration with one of the most badass females around. Chelsea and Victoria worked together to create a line that embodied all of Chelsea's vibes. The result? 8 authentic, heartfelt and, best of all, hilarious cards in the CHELSEA LEIFKEN x Paper Epiphanies line. #CLxPE This week, Chelsea kicks off our new EITHER | OR series -- to the amusement of all involved. Queen of the font, Chelsea is best known for her inspiring and relatable expressions, which make anyone who sees them smile. After graduating from FIDM LA, Chelsea faced several of life's inevitable but heart-wrenching waves, struggling to find herself and her message. Despite all of life's curveballs, or perhaps because of them, Chelsea is now the guru of mastering that which mastered her before. In addition to owning her own namesake collection based in LA, as well as working with several non-profit organizations and collaborators, this bosslady is on a self-titled, global movement of self love in which she shares her art around the world. Chelsea embarks on this mission with the biggest smile and infectious positive attitude a person can have, only one of the reasons we love her, in addition to her creativity and badass, yet hilarious personality. Check out her Either/Or questions below, along with her website and our CHELSEA LEIFKEN x Paper Epiphanies collab to see this amazing woman in action!